Macrophage itinerary in adipose tissue infiltration. (A) Macrophage infiltration occurs after initial rolling and attachment of monocytes to activated endothelial cells. These monocytes then extravasate through the endothelial cell layer and differentiate into macrophages. In this issue of the JCI, Weisberg et al. show that CCL2 and its receptor CCR2 play an important role in macrophage chemotaxis (11). 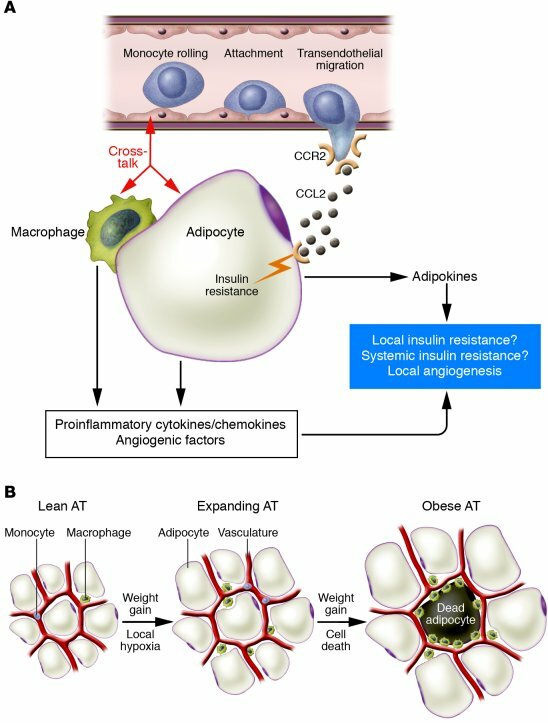 Cross-talk among adipocytes, macrophages, and endothelial cells may aggravate the inflammatory state, resulting in increased secretion of proinflammatory cytokines/chemokines, adipokines, and angiogenic factors. These factors could cause local and/or systemic insulin resistance in a paracrine and/or endocrine fashion, respectively, and might also induce local angiogenesis. (B) Adipose tissue (AT) expansion during weight gain leads to recruitment of macrophages through a variety of signals, which may include local hypoxia. These macrophages predominantly localize around dead adipocytes.